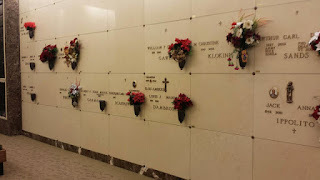 During a recent visit to Arizona, I was able to stop by the gravesite of former lightweight boxing champion Lou Ambers. Ambers, a native of Herkimer, New York, was known as the Herkimer Hurricane. 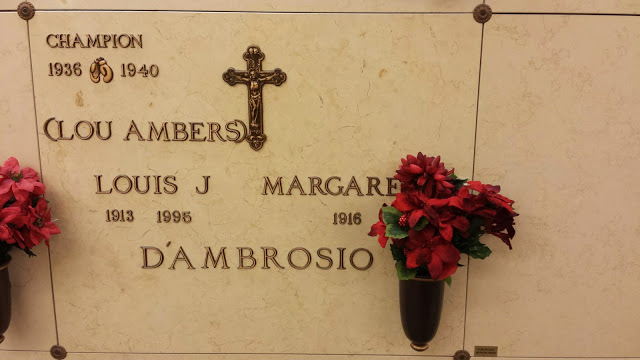 He was an Italian American fighter whose real name was Luigi Giuseppe d'Ambrosio. 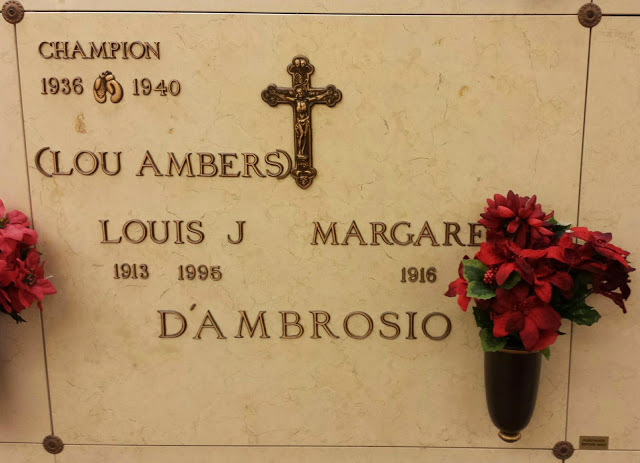 Ambers allegedly fought under the name Lou Ambers to prevent his mother from finding out about his profession. Ambers' career spanned from 1932 to 1941, and included two well-known fights against Henry Armstrong in 1938 and 1939. 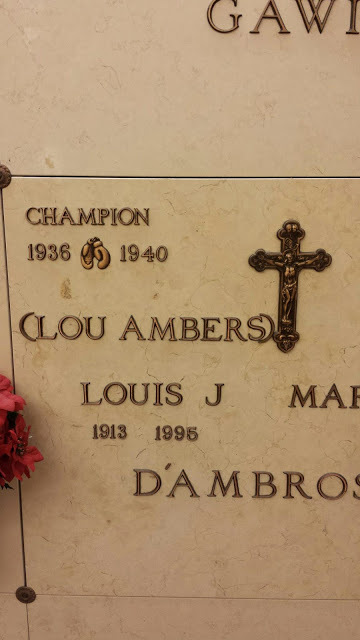 "One of the top lightweights of the 1930s, Lou Ambers built a reputation as a clever, aggressive boxer. Ambers first picked up the rudiments of boxing in a church basement gym in his native Herkimer, New York. When the Great Depression forced his family's restaurant to close and Ambers ended up working in a furniture factory, he decided to try boxing as a career. 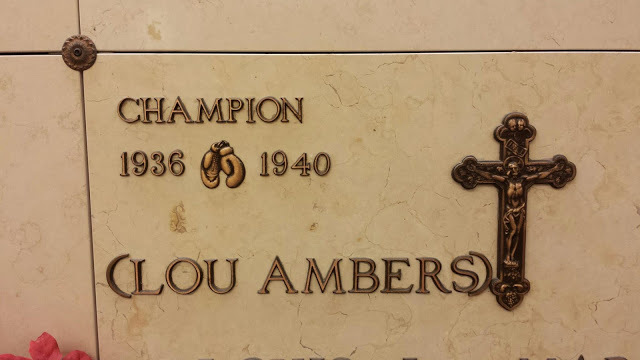 After fighting in amateur "bootleg" bouts for a few dollars a fight, Ambers entered the professional ranks with a second-round knockout of Frankie Curry in 1932. Ambers continued his winning ways as a pro, going undefeated in his first 32 fights. 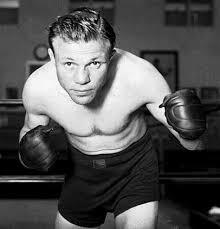 He earned the attention of The Ring and was named its ninth-best lightweight contender in the 1933 annual rankings. In 1935, Ambers fought his idol, Tony Canzoneri, for the world lightweight title vacated by Barney Ross. Ambers had previously been Canzoneri's sparring partner. Canzoneri quite easily dispatched Ambers, winning a fifteen-round decision. The next year Ambers faced Canzoneri for the title again. Fighting in Madison Square Garden before a crowd of 18,026, Ambers avenged the earlier defeat to claim the title. He scored with straight lefts-cutting Canzoneri under the eye-and with right uppercuts. Ambers maintained a healthy respect for Canzoneri's slugging ability and avoided serious damage while earning a unanimous decision. 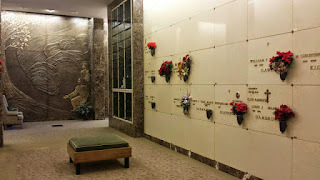 Ambers faced the sternest challenge to his title when he met the feather- and welterweight champion, Henry Armstrong, in Madison Square Garden in 1938. Armstrong knocked Ambers down in the fifth and sixth rounds. Although Ambers recovered sufficiently to gash Armstrong's left eye and mouth, Armstrong continued to fight, swallowing blood so that the damage to his mouth would not be apparent enough to force the referee to stop the fight. Armstrong won a split decision to take the lightweight title. Ambers won the title back in a rematch in Yankee Stadium the next year. It was a vicious fight in which Armstrong lost five rounds because of his low blows. Ambers delivered several telling punches to Armstrong's face and closed one of his eyes to win a split decision. A proposed third fight between these two well-matched fighters never took place. 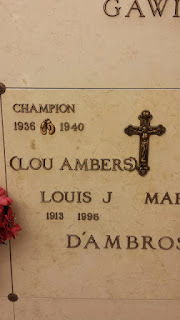 In 1940, Ambers lost the title when Lew Jenkins stopped him in three rounds. After losing the rematch to Jenkins in seven rounds, Ambers retired. He operated a restaurant and was involved in public relations after leaving the ring."